The Lucente is a slip on shoe with functioning stretch at the instep for accessibility. 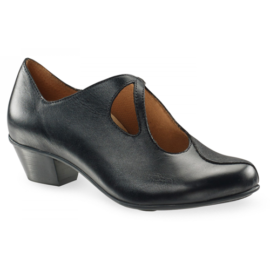 This style has a slightly padded heel cup for support & extra comfort. Naot’s anatomic cork & memory foam footbed is wrapped in leather & microfiber and molds to the shape of the foot with wear. This collection uses a hand-sewn stroble construction making it strong and extremely flexible. The Prima Bella Collection features a 2 3/4″ polyurethane sole with a metal shank.